Here is the ‘guest of honor’ for our dinner dinner. I have trimmed away some of the excess fat and will save this to render for future use. The roasting method I will be using will employ low temperatures for the first part of the cooking so that I can capture more fat as it roasts out. 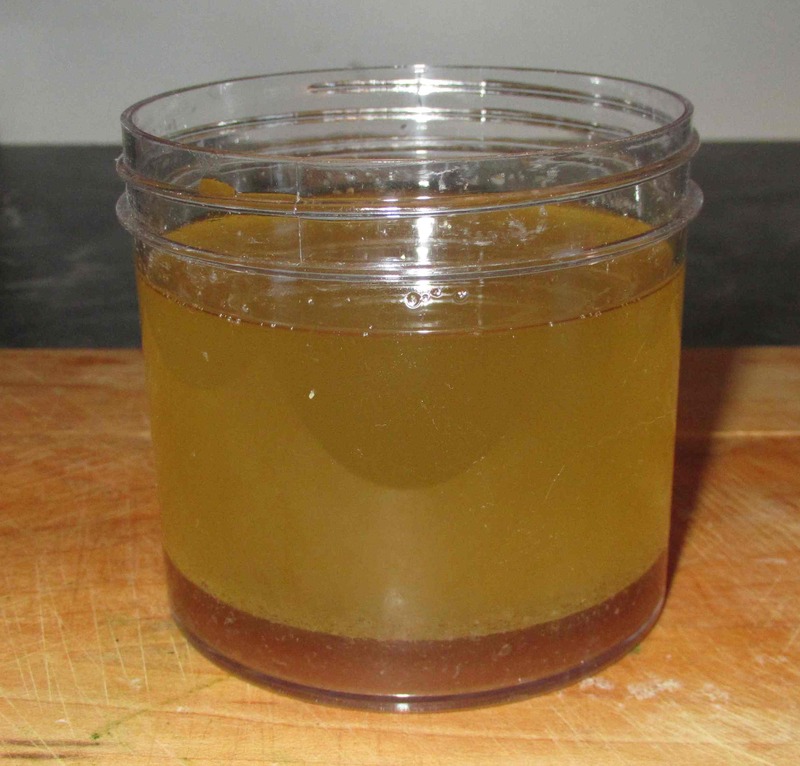 Duck fat, if you haven’t used it, is excellent for cooking and flavoring other dishes, especially vegetables. The neck will also be saved to make stock. Usually, the giblets are included in a little paper bag, but not inside this particular duck. 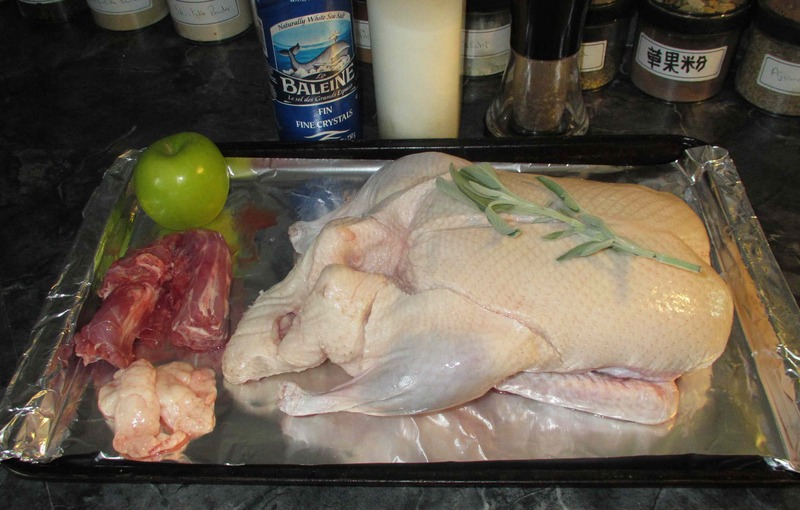 I am going to stuff the duck with slices of apple and a sprig of sage. The apple helps to keep the meat moist and adds a lovely flavor, especially to the fat. Beyond that, the only other ingredients required are salt, pepper, and a little bit of sugar. Step one is to tighten the skin as this will help achieve a crispiness during the roasting. 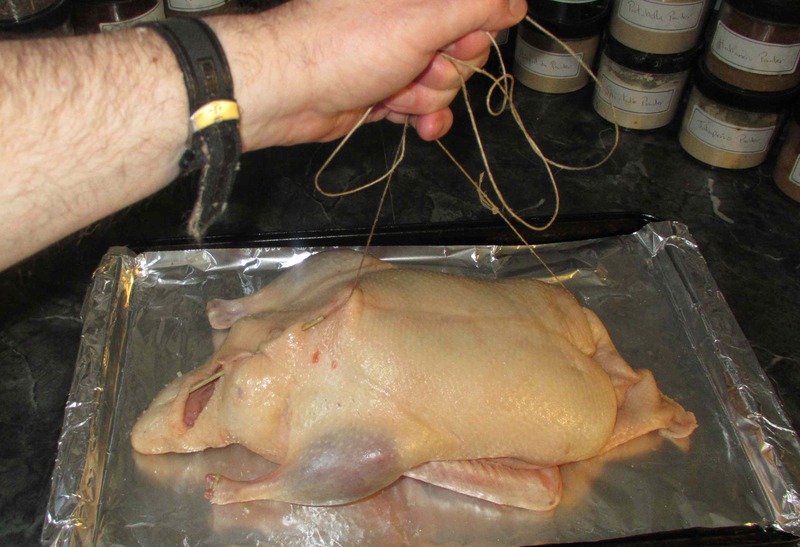 Put the duck in a rack and then pour a kettle of boiling water over it, turning during the process so that you drench all the skin and make it contract with the heat. The water needs to be completely boiling and, when you have finished, the skin should be quite hot to the touch. Next, the skin must be thoroughly dried. If flies are not a problem, you can air dry it outside, preferable in a nice windy location. 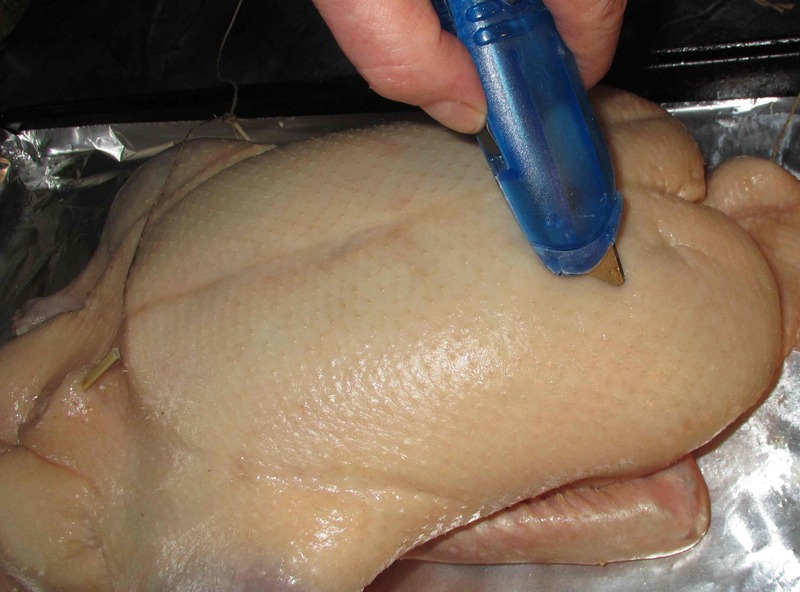 During drying, baste the duck completely using a heavy brine made of 1 tablespoon of salt for each tablespoon of water. Repeat this process over an hour or three until the skin is nicely dry and taut. By the way, insects are not a problem here but Ravens are and a good sized Tulugaq (the local name) could carry of my little duck so I am keeping a weather eye on it during the process! Once the duck is dry to your satisfaction, sprinkle salt and pepper inside the cavity and insert the apple (cut into quarters) and the sprig of sage. You don’t need to sew the openings closed but I find that a skewer through the front flaps helps keep them from collapsing inside and not cooking properly. 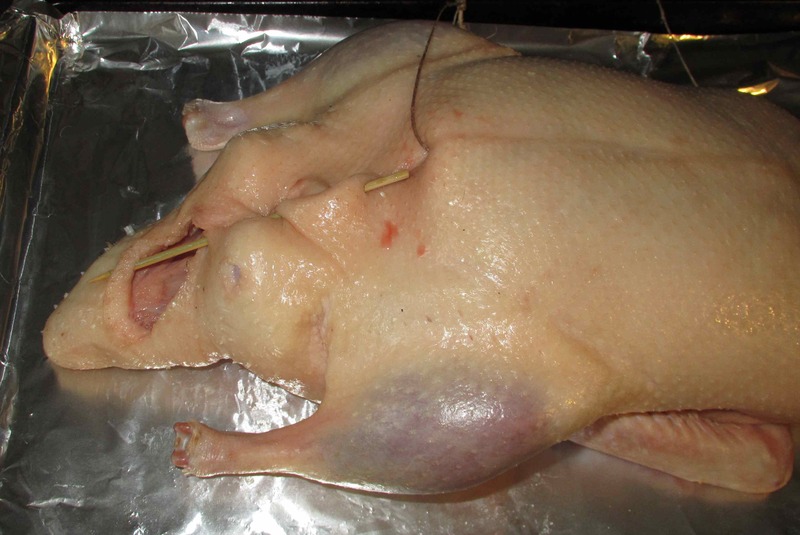 Before roasting, you will need to prick the skin all over with a sharp knife to allow the fat to drain as the bird cooks. Without this step, the skin will not crisp so, do both sides, paying particular attention to the areas with good pads of fat under the skin. 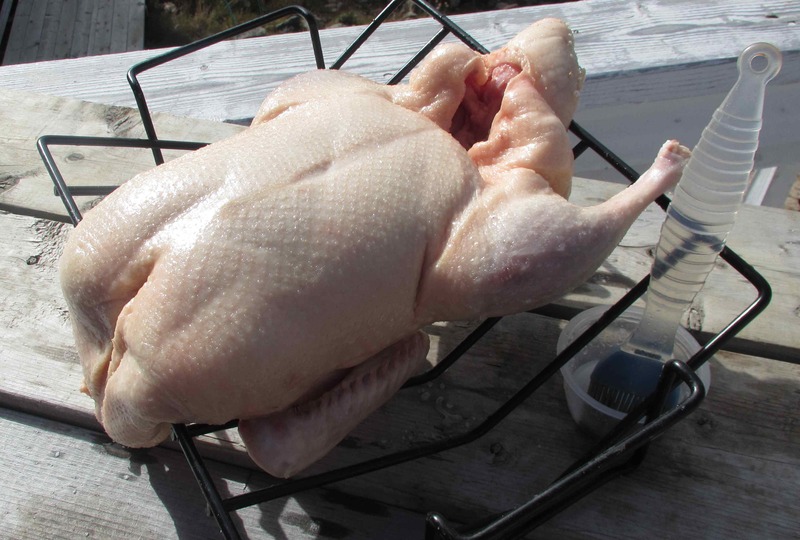 You will be doing this again as the bird roasts and you should avoid poking so deeply that you penetrate the meat. By the way, as I a little tip, you might want to try threading a cord through the body before stuffing. This is a technique I came up while roasting a big goose one year and it helps to give you a little control for turning the bird during cooking. If you are inclined to save the fat (and I recommend you do), pour it off each time you turn the bird. The low temperature for the first two hours of cooking will not only keep the flesh moist, but it will prevent the fat from getting too dark in the bottom of the roasting pan. For the final roasting, turn your oven up to 400 degrees and mix up about a teaspoon of salt and a tablespoon of sugar with a couple of tablespoons of water. 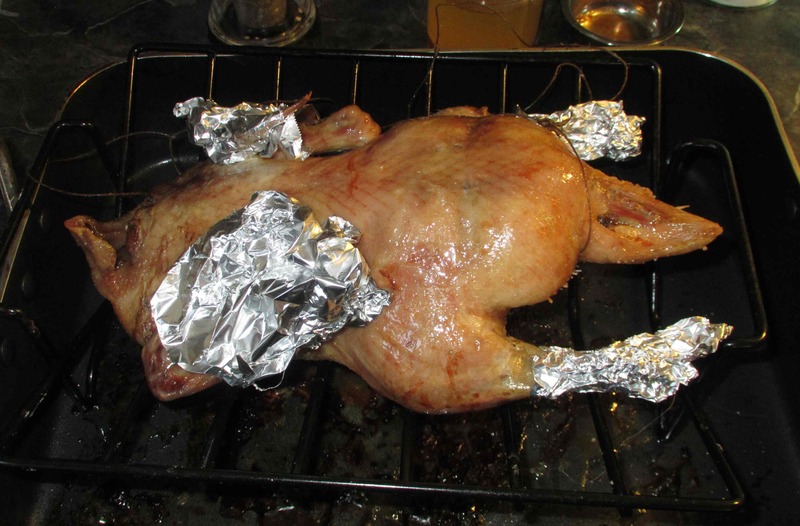 You may, at this point, also wish to do as I have done in the above picture and cover the leg and wing tips with foil to prevent overcooking. To continue, your duck will be backside down if you followed the above steps and we will roast it this way for a half hour and then turn it backside up for the last part, basting frequently with the salt and sugar mix. 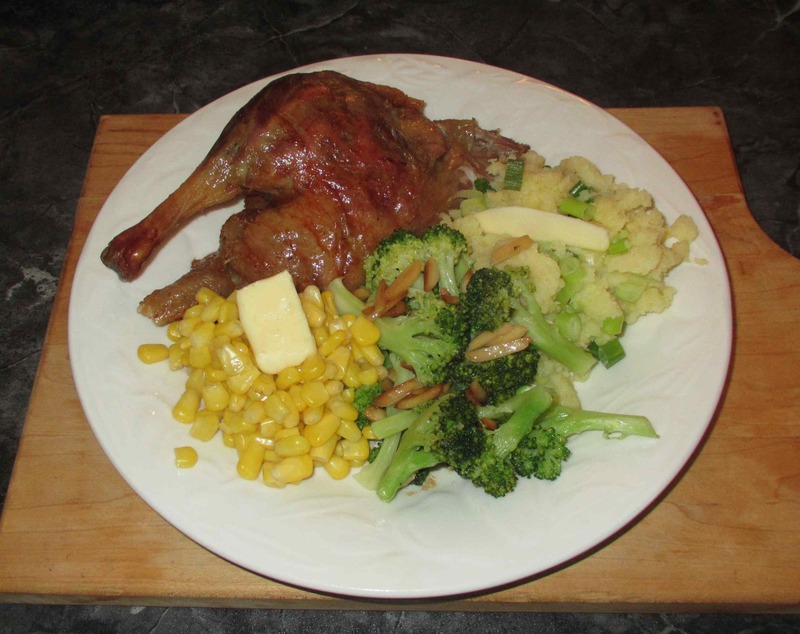 The length of the last roasting segment will vary depending on the size and fattiness of your duck along with the actual temperature of your own oven, but about 30 – 45 minutes should do it. 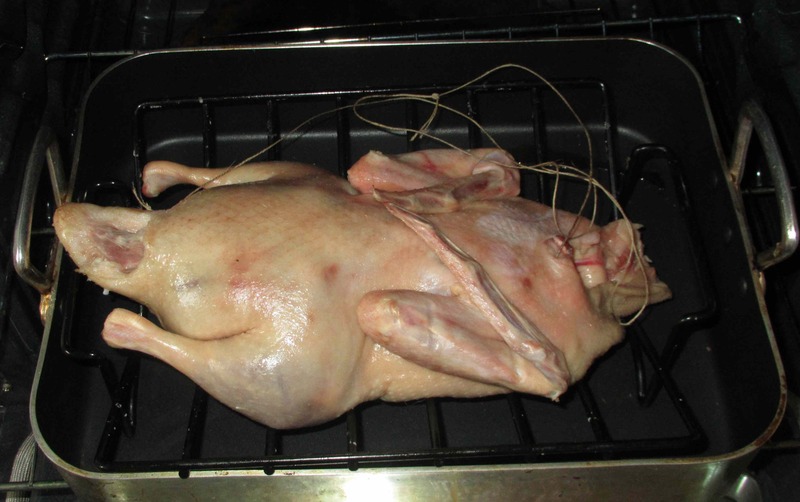 When the skin is nicely brown and crisp, remove the duck from the oven and let it rest under loosely tented foil for about 15 minutes or so before carving. Well, the duck turned out very nicely. There were a couple of very small patches where the skin wasn’t quite as crispy as the rest but, otherwise, it was very good. I served it with mashed potatoes and scallions, sweet corn niblets, and broccoli sautéed in butter with almonds and lemon juice and we enjoyed a lovely meal. We only ate half the duck, so I will be having the rest, one way or another, over the next couple of days. Love, Love, Love roasted duck. This looks superb! I’m sure your wife will hurry back; that looks delicious!! Very jealous of you for having all the beautiful duck fat!! I enjoy rosat duck, but collecting the fat for later is one of the main reasons I do it as often as I do. how, how wonderful! When I worked at Tufts U in Boston, I walked by window after window of hanging roasted ducks. The MDs and PhDs I worked with tried to warn me off but after making a few friends among the shop keepers, I bought one. Taking it home on the subway was like a long drive to a great restaurant and I was not disappointed! Your clear, easy, step by step tutorial and photos make this dish doable for everyone. Thanks for sharing. My pleasure …. I want to tackle Peking duck successfully some time. Haven’t had good results yet though. Thanks for the tip on cooking duck. Now that I have these tips from you maybe I will go on a duck cooking adventure. It *is* an adventure … there are so many conflicting bits of advice about how to get the best results. 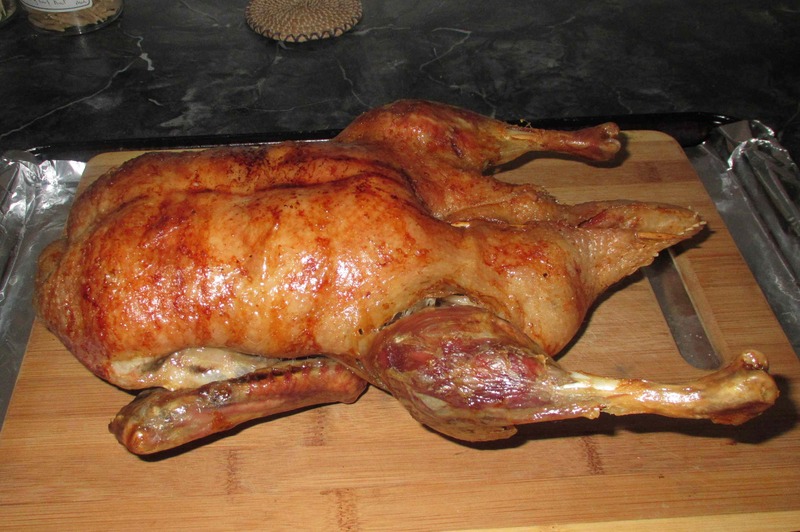 I’m thinking of doing a ‘tea-smoked’ duck sometime soon!